The pasta making in this recipe is very involved due to all the colors. We recommend that if attempting this recipe, you have made pasta before and have a helper or two. In 5 separate bowls, add 1 egg and 3/4 cups of flour. To one bowl, add the 2 extra yolks and 1 teaspoon of tomato paste. To the next bowl, add the rest of the paste. To a third bowl add the spinach puree, and to the 4th, add the raspberry liquor. Mix and knead each bowl separately, creating 5 different colors of dough. Add flour as needed -- some of these bowls will need a lot more flour due to the wet additions. The texture of each dough should be similar to the dough that doesn't have any additions. Roll out the doughs in your pasta maker to the second-thinnest setting. Next run it through the spaghetti cutter. When water comes to a boil, remove the sausage from its casing and cook until browned in a large frying pan. Split the chard leaves from the stalks. Cut the stalks into small chunks and add to the sausage. Cook 5 minutes. Add the leaves and wilt. Add the cream and bring to a simmer. Cook the pasta only about a minute and a half. Remove the pasta from the water and add to the sausage mixture. Stir to coat pasta and serve. For the bread I used some more of the tomato paste as red, leftover sweet potato for the orange, cheese for yellow, more of the spinach puree for green, and kalamata olives for purple. Notes: 1) I don't like using food coloring, but feel free to use it instead of the purees and pastes. 2) If you want to make this pasta dish without coloring the pasta, the ratio is 3 3/4 cups of flour to 5 eggs. When I found out Tablespoon was having Double Rainbow Week again (Double Double Rainbow Week?) I decided to up the ante and pull out a TRIPLE rainbow pasta. The first rainbow is homemade rainbow spaghetti, the second is rainbow chard, and the third is a cheesy rainbow bread on the side. Making pasta at home is a fun and rewarding task, one that I love doing more than almost anything in the kitchen. However, it does take some time and practice. You aren’t going to make perfect pasta on your first attempt, but it will be good enough to make you want to try again. 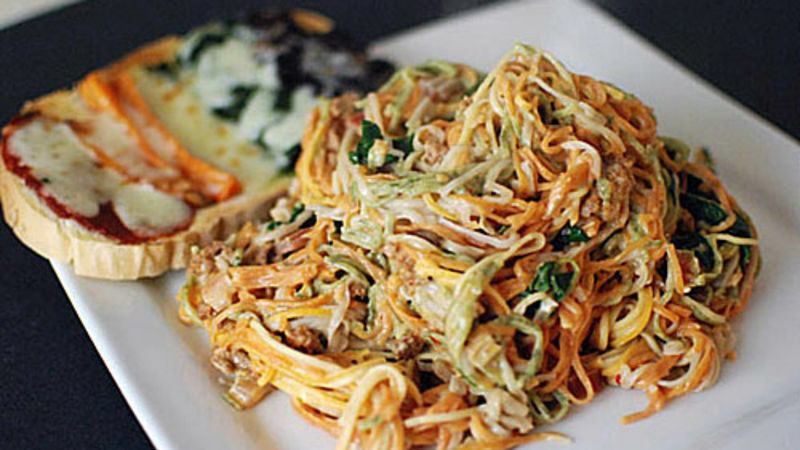 If you have never made pasta at home, I suggest trying this recipe without coloring the pasta. Have a friend over on a lazy Sunday, crack a bottle of wine, put on some music, and make some tasty homemade spaghetti. If you have made pasta before at home, mixing in the colors isn’t so bad. It would be even easier and more vibrant if I didn't have a personal aversion to food coloring! Feel free to use the food coloring if you like. For some reason I think that is cheating, so when I make colored pasta I use tomato paste and spinach puree. Coloring all the small batches of pasta dough. If I were to ever actually have a double rainbow moment, I think it would be while making homemade pasta. I just can’t get over how beautiful it is! But what does it mean? I used a cookie rack as the pasta dryer. I just placed the pasta on here as I made them so they wouldn't stick together. The second rainbow! Rainbow chard is pretty common in the grocery stores these days. I like to chop the stems and cook them a bit longer than the leaves. Here they are with some Italian sausage. Shard leaves added to wilt in the pan. Add some cream to complete the sauce. When it was time to cook the pasta, I put the whole rack into the boiling water. Work quick! Homemade pasta cooks in less than 2 minutes. Add it right to the sauce and stir to coat. The purple got a little washed out, but other than that, I am very happy with the colors in this pasta! Oh, and did I mention that it is delicious? The sauce is subtle so you really can taste the pasta. All your hard work on the spaghetti really pays off and comes through in the final dish. Dan Whalen wonders if double rainbow guy would cry while eating this pasta. Check out his blog at The Food In My Beard; check Dan’s Tablespoon profile often to try his recipes with creative international spins!